2,3-Butanediol (2,3-BD) is a high-value chemical usually produced petrochemically but which can also be synthesized by some bacteria. To date, Klebsiella pneumoniae is the most powerful 2,3-BD producer which can utilize a wide range of substrates. However, many by-products are also produced by K. pneumoniae, such as ethanol, lactate, and acetate, which negatively regulate the 2,3-BD yield and increase the costs of downstream separation and purification. In this study, we constructed K. pneumoniae mutants with lactate dehydrogenase (LDH), acetaldehyde dehydrogenase (ADH), and phosphotransacetylase (PTA) deletion individually by suicide vector conjugation. These mutants showed different behavior of production formation. Knock out of ldhA had little influence on the yield of 2,3-BD, whereas knock out of adhE or pta significantly improved the formation of 2,3-BD. The accumulation of the intermediate of 2,3-BD biosynthesis, acetoin, was decreased in all the mutants. The mutants were then tested in five different carbon sources and increased 2,3-BD was observed. Also a double mutant strain with deletion of adhE and ldhA was constructed which resulted in accelerated fermentation and higher 2,3-BD production. In fed-batch culture this strain achieved more than 100 g/L 2,3-BD from glucose with a relatively high yield of 0.49 g/g. 2,3-BD production was dramatically improved with the inactivation of adhE and pta. The inactivation of ldhA could advance faster cell growth and shorter fermentation time. The double mutant strain with deletion of adhE and ldhA resulted in accelerated fermentation and higher 2,3-BD production. These results provide new insights for industrial production of 2,3-BD by K. pneumoniae. Biorefineries for chemicals have attracted a great deal of interest because they can alleviate the dependence on oil supply for the production of platform chemicals, reduce environmental pollution, and ensure sustainable development[1, 2]. Biological production of 2,3-butanediol (2,3-BD) has increased remarkably because of its wide industrial applications[3–5]. Many microorganisms classified in the genera Enterobacter, Klebsiella, Serratia, and Bacillus can produce 2,3-BD[3, 4]. K. pneumoniae is a potentially useful producer in the industry because of its wide substrate spectrum, high efficiency, and cultural adaptability[6–8]. The fermentation pathways of mixed acid-2,3-BD in bacteria have been intensively studied. Numerous studies have investigated the use of metabolic engineering to modify the metabolic pathways for improving 2,3-BD production in Enterobacter aerogenes, Bacillus licheniformis, and K. oxytoca. The formation of ethanol, lactate, and acetate competes with the biosynthesis of 2,3-BD for pyruvate, resulting in reduced 2,3-BD production[4, 12–14]. For example, the inactivation of acetaldehyde dehydrogenase gene significantly increases the 2,3-BD yield and decreases ethanol production. Deletion of the ldh gene encodes lactate dehydrogenase (LDH) in E. aerogenes, resulting in a very small amount of lactate yield and 16.7% more 2,3-BD than that of the parent strain in batch fermentation. The ldh, ldhB, and ldhX genes in Lactococcus lactis, which encode LDH, have been deleted, and the results showed that ΔldhB is a valuable basis for engineering strategies for the production of reduced compounds. The deletion of adhE in K. oxytoca increases the hydrogen yield of the mutant by 16.07% but decreases the ethanol concentration by 77.47%, compared with those of the parent strain. However, only a few studies have focused on K. pneumoniae engineering[17–19]. Ji et al. reported that the overexpression of NOX and nox-2, which can decrease the intracellular nicotinamide adenine dinucleotide plus hydrogen (NADH)/nicotinamide adenine dinucleotide (NAD) + ratio in K. pneumoniae, could improve acetoin production. Zhang et al. investigated the effect of inactivating aldehyde dehydrogenase in K. pneumoniae on 1,3-propanediol production. However, metabolic engineering focused on 2,3-BD production in K. pneumoniae has not yet been intensively investigated. K. pneumoniae produces 2,3-BD from a wide range of substrates but generates numerous byproducts, thereby increasing the cost of product downstream separation. The genetic alteration of K. pneumoniae perhaps makes it more efficiency in industry. In this study, K. pneumoniae mutants with deletion of LDH, ADH and phosphotransacetylase (PTA) were constructed to evaluate the effect on 2,3-BD production. The metabolic flux and production of byproducts, such as ethanol, acetoin, lactic acid, and acetate, were also investigated. The activities of LDH, ADH, and PTA in the mutants and parent strain were determined. As shown in Table 1, the LDH activities of ldhA, adhE, and pta deletion strains were 12.02%, 93.35%, and 97.80% of the parent strain, respectively. The PTA activities of ldhA, adhE, and pta deletion strains were 69.83%, 71.48%, and 1.65% of the parent strain, respectively. The ADH activities of ldhA, adhE, and pta deletion strains were 102.99%, 2.24%, and 85.76% of the parent strain, respectively. These results further confirmed the knockdown efficiency of these three genes respectively. Table 1 also shows that knockdown of one gene could affect the other enzyme expression or activity. For example, the ΔldhA mutant showed high production of ethanol (Figure 1B), which may be caused by the high ADH activity. The production of lactate, ethanol and acetate was different in ldhA, adhE, and pta deletion mutants, which also proved this point. Perhaps the different metabolic pathways are complicated, and could crosstalk with each other. 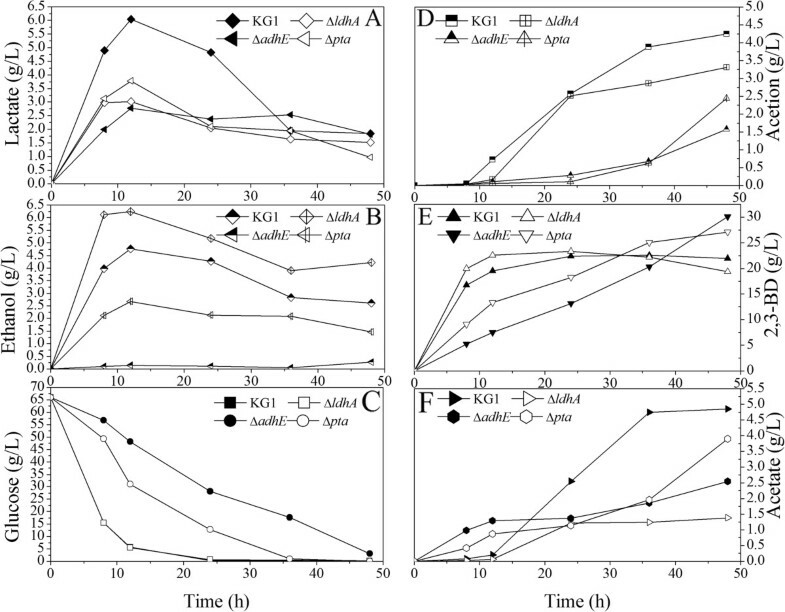 Metabolite profiles of the K. pneumoniae parent strain (KG1) and the mutants in the batch culture. KG1: the parent strain; ΔldhA, ΔadhE, and Δpta: the mutants. A) Lactate; B) Ethanol; C) Glucose; D) Acetion; E) 2,3-BD; F) Acetate. The curves were calculated from one measurement of three experiments. To investigate the effect of ldhA, adhE, and pta deletion on cell growth, the mutants and parent strain were cultured under the same conditions. In the first 8 h, knockout of ldhA promoted cell growth, whereas knockout of adhE and pta inhibited cell growth (Figure 2). The biomass accumulations of ΔldhA and Δpta strains were higher than that of the parent strain at 12 h. The Δpta strain achieved the highest biomass compared with other mutants and parent strains at 12 h, indicating that the strain exhibited good fermentation performance, although the growth rate was lower in the first 8 h.
Growth curves of the parent and mutants of K. pneumoniae with 20 g/L glucose. KG1: the parent strain; ΔldhA, ΔadhE, and Δpta: the mutants. DCW, dry cell weight. The curves were calculated from one measurement of three experiments. The internal redox state was investigated from 4 h to 36 h in the fed-batch fermentation. As shown in Figure 3, in ΔldhA mutant fermentations, the total dinucleotide pool and NADH/NAD + ratio was very high in the early exponential period, then gradually decreased in the late stationary phase, whereas, the total dinucleotide pool and NADH/NAD + ratio in adhE and pta mutants was low at 4 h to 12 h, then increased significantly from 18 h, respectively. Compared with K. pneumoniae parent strain (KG1), the NAD+ level decreased whereas NADH increased in the fermentation of ΔadhE and Δpta mutants. Thus, the NADH/NAD + ratio was much higher in the ΔadhE and Δpta from 12 h. This variation coincides with 2,3-BD flux distribution. Time courses profile of nucleotide pools in K. pneumoniae parent strain (KG1) and the mutants in the batch culture. KG1: the parent strain; ΔldhA, ΔadhE, and Δpta: the mutants. The curves were calculated from one measurement of three experiments. NAD, nicotinamide adenine dinucleotide; NADH, nicotinamide adenine dinucleotide plus hydrogen; DCW, dry cell weight. The concentrations of major metabolites in mutants and parent strains were investigated (Figure 1). As shown in Figure 1, three mutants showed different metabolic performance. The inactivation of ldhA resulted in 90% reduction in lactate production, which confirmed that ldhA was the major LDH manufacturing gene in K. pneumoniae. The 2,3-BD production of ΔldhA reached 22.52 g/L at 12 h, whereas that of the parent strain was only 19.51 g/L. The maximum 2,3-BD production of ΔldhA was 23.32 g/L at 24 h, whereas that of the parent strain reached maximum (22.57 g/L) at 36 h. The fermentation time was shortened from 36 h to 24 h. For byproducts, the ΔldhA mutant strain produced 18.87 g/L succinate and 12.31 g/L ethanol, which were 67.4% and 53.7% higher than those in the wild-type strain. However, 2,3-BD production did not increase significantly. The highest production of 2,3-BD was achieved at 48 h by the ΔadhE strain, which reached 30.10 g/L. And the highest production of 2,3-BD by the parent strain was 22.57 g/L in 36 h. Although the fermentation time was longer than the wild-type strain, 2,3-BD production increased by 33.65%, and yields of approximately 94% were obtained. The recombinant strains produced less acetoin, acetic acid, ethanol, and lactic acid, because the corresponding enzyme activity was lower.. The 2,3-BD production also reached 27.32 g/L at 48 h in the Δpta strain. Lactate production was lower than the ΔadhE and parent strains. The Δpta strain produced more acetate, acetoin, and ethanol than the ΔadhE strain, but their production rates were lower than those of the wild-type strain. Acetate production decreased by only 19.58% compared to that of the parent strain. K. pneumoniae can naturally use a wide spectrum of carbon sources effectively. Five carbon sources, such as glucose, galactose, fructose, maltose, and lactose, were chosen to test the metabolic effects of mutants (Tables 2 and3). 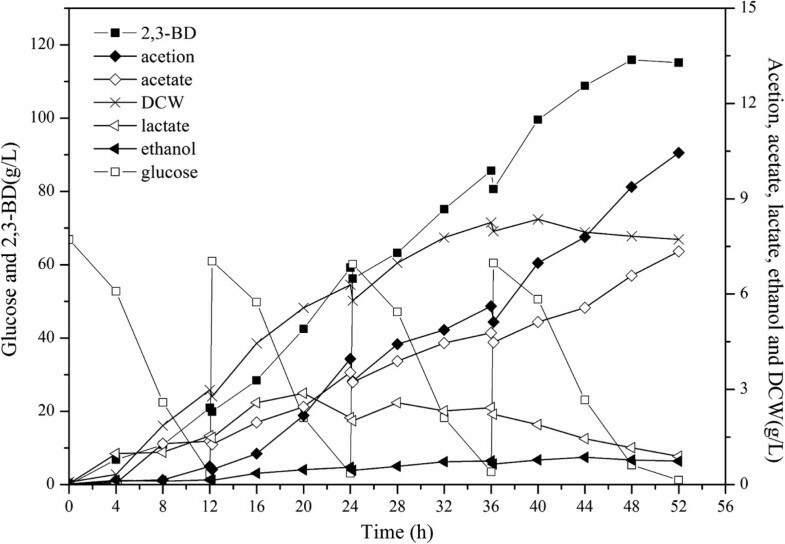 As shown in Table 2, ethanol production and glucose consumption significantly increased, whereas lactate and acetate production decreased by the ΔldhA strain in a flask culture with glucose, galactose, fructose, or maltose, respectively. However, 2,3-BD production slightly increased. This result suggests that the reduced pH in the ldhA mutant cultivation media increases 2,3-BD production. 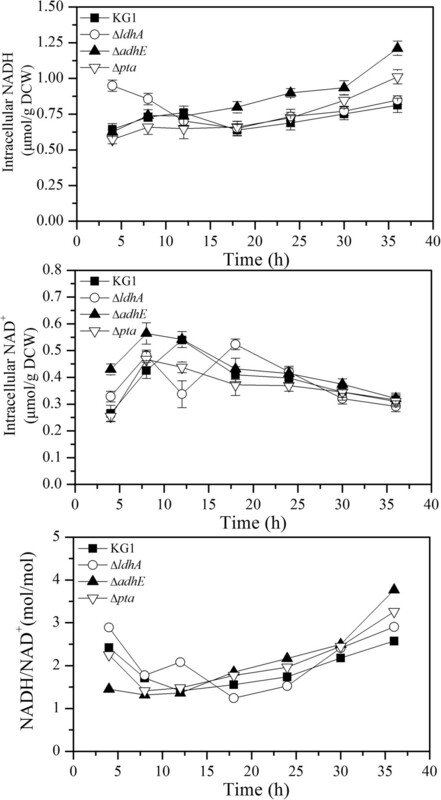 Lactate and acetate production decreased, which alleviated the inhibition of cell growth. The ΔldhA mutant underwent less pH shock than that of the wild-type strain; thus, a shorter fermentation time was observed. The 2,3-BD production of the ΔadhE and Δpta mutants increased similarly with galactose, fructose, and maltose (Table 3). These carbon sources are consumed in the glycolytic pathway, similar to glucose. The highest production of 2,3-BD was observed in ΔadhE, but the Δpta strain exhibited high acetoin production. The wild-type KG1 was ineffective in converting lactose to 2,3-BD because of its low lactose consumption rate. Galactose consumption slightly increased in the mutants, but the reason remains unclear. The 2,3-BD production from lactose decreased in mutants. However, the consumption and 2,3-BD production from galactose in mutants were better than those in the parent strain KG1. Overall, the mutants enhanced 2,3-BD production with glucose, galactose, fructose, or maltose, respectively, but 2,3-BD production decreased with the use of lactose. As shown in Figure 1 and Figure 2, the ldhA deletion could promote cell growth, and adhE deletion could increase 2,3-BD yield, so a double-mutant ΔadhE ΔldhA was constructed to produce 2,3-BD with high efficiency. As shown in Figure 4, the 2,3-BD production was achieved at 24 h by the double-knockout mutant, and reached 29.48 g/L. The productions of lactate and ethanol decreased significantly and the rate of glucose consumption increased, compared with the parent strain, respectively. 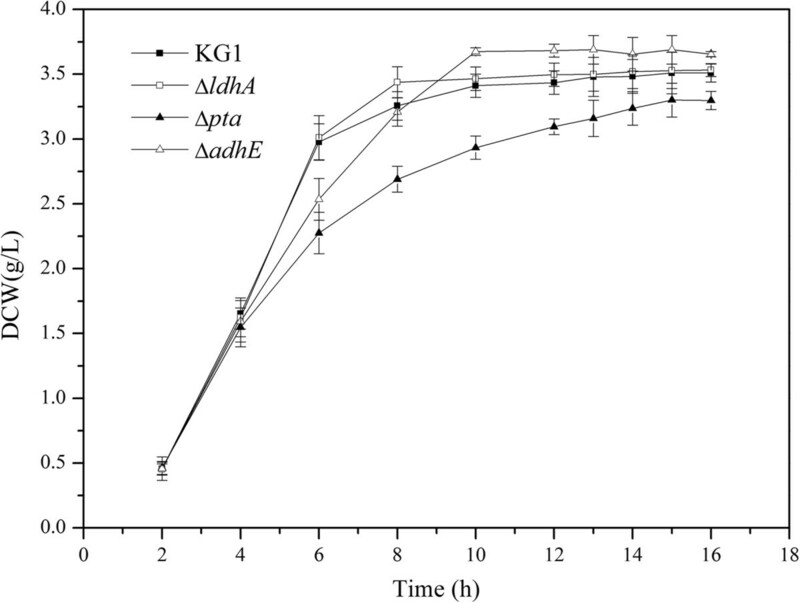 Metabolite profiles of the K. pneumoniae parent strain (KG1) and ΔldhA ΔadhE mutant in the batch culture. The curves were calculated from one measurement of three experiments. 2,3-BD, 2,3-Butanediol. A) 2,3-BD; B) Acetion; C) Acetate; D) Lactate; E) Ethanol; F) Glucose. Fed-batch culture could enhance 2,3-BD production and reduce the cost of production by taking full advantage of the substrate. Thus, fed-batch fermentations were conducted in a 5-L bioreactor. As shown in Figure 5, a fed-batch culture was carried out by feeding glucose solution. In order to maintain optimum levels of glucose, about 750 mL of 600 g/L glucose was added to the bioreactor throughout the fermentation. After 52 h, the fed-batch fermentation of the ΔadhE ΔldhA strain produced about 116 g/L of 2,3-BD, whereas the time courses of the other metabolites had the same tendency with the batch culture (Figure 5). Fed-batch fermentation profiles of Δ ldhA Δ adhE mutant. DCW, dry cell weight; 2,3-BD, 2,3-Butanediol. The curves were calculated from one measurement of three experiments. Numerous attempts have been made to reduce the carbon flux to by-products and increase the NADH availability for 2,3-BD through metabolic engineering in several strains[23–25]. In this study, to channel the reducing power toward the desired redox-reaction, genes encoding LDH, ADH, and PTA (ldhA, adhE, and pta) of K. pneumoniae were knocked out. First, lactate, ethanol, and acetate are the major byproducts that consume carbon flux from carbon in 2,3-BD production. Second, the formation of lactate and ethanol requires NADH, which competes with 2,3-BD production process. Genetically engineered strains always exhibit a slow growth speed because of the changes in the metabolic pathway[17, 26]. However, in our system, the mutants showed different cell growth patterns (Figure 2). The ΔldhA strain showed faster growth than the Δpta, ΔadhE, and parent strains. The main reason for the increase in cell growth may be due to the decrease in lactate production, resulting in a low acidification rate of the media. Indeed, compared to the wild-type strain, NaOH spent by the ldhA mutant in batch fermentation decreased by 70%. Deletion of the ldhA maybe increased the carbon flux to acetyl-CoA, which was subsequently converted to ethanol and biomass. However, 2,3-BD production did not improve significantly, which is consistent with a previous study. The increased production of ethanol was attributed to the redirection of carbon flux and NADH to ethanol production. In anaerobic conditions, cells are forced to produce different byproducts (mostly ethanol) for the balancing of NADH2 and the 2,3-BD yield is always limited. However, in our system, ethanol amounts were low (as shown in Table 2 and Table 3). We have repeated this experiment more than 10 times, and obtained the same result every time. The NADH regeneration was mainly caused by the ethanol, acetoin and succinic acid pathway. But under microaerobic conditions, the other pathway was perhaps also involved, such as: NADH2 + ADP + 1/2 O2 → NAD++ATP + H2O. On the other hand, Ji et al. also reported that the 2,3-BD yield of the mutant with inactivation of acetaldehyde dehydrogenase gene increased by 6.67%, whereas ethanol and acetoin concentration was 0.45 g/L and 0.98 g/L, decreased by 92.21% and 64.1%, respectively. The values of reducing equivalent recovery (RH) (Table 2) were scattered between 0.54 and 1.24, which also suggests that there are existed other NADH regeneration pathway. The Δpta and ΔadhE strains showed slower cell growth than the wild-type strain in the first 8 h, whereas the ΔadhE strain achieved the highest biomass accumulation. The inactivation of ADH and PTA genes significantly increased 2,3-BD production. The production of acetate and ethanol dramatically decreased in both mutant strains, which redirected the carbon flux to 2,3-BD production, and the increased intracellular NADH concentration and the NADH/NAD + ratio altered the metabolite spectrum of the mixed acid-2,3-BD fermentation pathway. The most direct result was the reduction in acetoin accumulation with increasing 2,3-BD production. However, the highest production of 2,3-BD was obtained by the ΔadhE strain compared to the mutants and wild-type strains. This result may be due to the reduction in acetoin and ethanol production in ΔadhE, which decreased by 62.73% and 89.65%, respectively, compared with those in the parent strain. The effect of LDH, ADH, and PTA disruption was tested using five different carbon sources. The ldhA mutant showed an improvement in carbon source consumption rates, biomass production, and 2,3-BD production with all carbon sources, except for lactose, compared to the control cells. As shown in Table 2 and Table 3, the yield of ethanol was very high when maltose was used as the substrate in both mutants and wild-type strains, and 2,3-BD production was not the highest, because the ethanol formation pathway competed with 2,3-BD production pathway for the NADH and carbon flux supply. We also found that, when galactose was used as the carbon source in a 36-h flask cultivation, the lactate content was much lower in the mutants than in the wild-type strains. This is also interesting; perhaps knockout of these genes partially blocks the lactate metabolic pathway, providing more energy and sources for the strains to produce 2,3-BD. The 2,3-BD production increased significantly in the pta and adhE mutants from all carbon sources, except lactose. However, their biomass production and carbon source consumption rates decreased compared with those of the parent strain. The carbon source consumption, biomass production, and 2,3-BD production rates decreased significantly in the mutants when lactose was used as the major carbon source. Lactose consumed only 10.1 g and 17.78 g in Δpta and ΔadhE strains for 36 h, respectively, which was 20.44% and 35.39% of that of the parent strain. Thus, the production of byproducts significantly decreased. In K. pneumoniae strains, lactose hydrolysis is the limiting step because lactose must first be hydrolyzed by enzymatic processes into monosaccharides, which can then be further converted into butanediol in a second stage when lactose is used as a major carbon source. The deletion of ldhA, adhE, and pta negatively affected the enzyme level of lactose metabolism, which caused the slow lactose utilization rate. The lactose permease activity of KG1, ΔadhE, ΔldhA and Δpta was 8.07 nmol/minute/g,4.91 nmol/minute/g, 4.02 nmol /minute/g,, and 3.98 nmol/minute/g, respectivity. The β-galactosidase activity of KG1, ΔadhE, ΔldhA and Δpta was 0.45 IU/mg, 0.28 IU/mg, 0.36 IU/mg and 0.27 IU/mg, respectively. The low activity of lactose permease and β-galactosidase maybe the reason for inefficient lactose consumption. However, the reasons for the altered lactose fermentation in mutants need further study. The engineering strategy pursued in this study, which was based on the redirection of carbons toward the production of byproducts, led to the development of K. pneumoniae strains with high efficiency for 2,3-BD production. In conclusion, 2,3-BD production was dramatically improved with knockout of adhE and pta. Knockout of ldhA could advance faster cell growth and shorter fermentation time. The double-mutant strain with deletion of adhE and ldhA resulted in accelerated fermentation and higher 2,3-BD production, although the best fermentation results in our engineered strain are almost at the same level as in wild-type microorganisms. However, we expanded the source strain for 2,3-BD fermentation and decreased the fermentation time, but we think that even genetic engineering is more efficient than traditional screening for 2,3-BD fermentation. In the near future, we should focus on optimizing the fermentation and purification to obtain a high 2,3-BD yield. In summary, these results provide new insights for industrial production of 2,3-BD. K. pneumoniae KG1, which was deposited at the China Center of Industries Culture Collection (CICC 10781), was used for the parent strain for 2,3-BD production. The plasmids and strains used in this study are listed in Table 4. The Escherichia coli strain DH5α was used for the construction and amplification of plasmids. Total genomic DNA of K. pneumoniae and E. coli cells were extracted using the AxyPrep Bacterial Genomic DNA Miniprep kit. The primers used in this study are listed in Table 5. The ldhA’ fragment (an 805 bp segment of truncated ldhA gene) (GeneID: 5339517 [Genbank]) was amplified by PCR using total genomic DNA as a template and primers ldh A’-up and ldh’A-down, which were designed using the sequence information of ldhA of K. pneumoniae. The PCR mixture consisted of 1 ng of genomic DNA, 0.2 mmol each dNTP, 0.2 μmol each primer, 2 μL of rTaq PCR buffer, and 1 unit of rTaq DNA polymerase (TaKaRa, Dalian, China) in a total volume of 20 μL. The PCR reaction was carried out at 95°C for 5 minutes, followed by 30 cycles at 95°C for 40 s, 63°C for 90 s, 72°C for 120 s, and a final extension step of 72°C for 10 minutes. The adhE’ (an 872-bp segment of truncated adhE (GeneID: 5341804 [Genbank]) gene) and pta’ (an 901-bp segment of truncated pta (GeneID: 5338823 [Genbank]) gene) fragments were amplified by PCR using the corresponding primers. The PCR reaction procedure was the same as that of ldhA, but the annealing temperatures were 52°C and 57°C, respectively. The ldhA’ fragment was cloned into the pRE112 suicide vector after digestion with Kpn I and Sac I, and then 180 bp was digested by Sph I, which resulted in vector p-ldh A’. The strain containing the p-ldh A’ plasmid was used as a donor in conjugation with KG1. Transconjugants were selected for both chloromycetin resistance from pRE112 insertion and ampicillin resistance because the KG1 strain was resistant to ampicillin, whereas E. coli S17-1 was sensitive. To construct p-ad hE’, the DNA fragment of adhE’ was cleaved by Sph I and Sac I, and then ligated into the Sph I and Sac I sites of pRE112. The p-pta’ plasmid was constructed by cloning the pta’ DNA fragment into the vector pRE112 using the restrictions sites SphI and SacI. To construct the gene-deficient mutants, E. coli S17-1, containing the plasmids p-ldh A’, p-adh E’, and p-pta’, was used as a donor in conjugation with KG1. Transconjugants were selected by Luria-Bertani (LB) plates with 100 μg/mL ampicillin and 30 μg/mL chloromycetin. PCR was used to confirm that the transconjugants were the correct insertion mutants. Oligonucleotides primer cat-up and primer cat-down were designed to amplify a 940-bp segment of p-ldh A. Total DNA from KG1 and the four transconjugants were used as a template, and the p-ldh A plasmid DNA was used as a positive contrast. Primer cat-up and primer L-down were used to verify the gene deletion of fixed-point validation. The ldhA mutant strains were verified by PCR using the primers cat-up and L-down, with the 5′ region of the cat (5′-CGGGCCCTAAATACCTGTGACGGAAGAT-3′) and the 3′ region of the chromosome of K. pneumoniae (5′-CCGTCCGACACTTTACCTTCC-3′). The adhE mutant strains were also verified by PCR using primers cat-up and A-down, whereas the pta mutant strains were verified by PCR using primers cat-up and P-down. To make the ΔadhE ΔldhA double mutant, the ΔldhA was cultured on 10% sucrose plates to select double-crossover transconjugants. Proper in-frame deletion of the ldhA gene was verified by PCR. And E. coli S17-1, containing the plasmids p-adh E’ as described above was used as a donor in conjugation with K. pneumoniae ΔldhA. Correct integration of the adhE deletion was confirmed by PCR using primers as described above. The E. coli strain DH5α was incubated in LB medium with 30 μg/mL kanamycin or 25 μg/mL chloramphenicol resistances for plasmid maintenance. The glucose fermentation medium (pH 7.0) was composed of glucose (80 g/L), yeast extract (10 g/L), KH2PO4 (10 g/L), K2HPO4 (7.2 g/L), (NH4)2SO4 (2 g/L), sodium citrate (4 g/L), and trace element solution (1 mL). K. pneumoniae was cultured in the glucose fermentation medium at 35°C and 150 rpm. The trace element solution was composed of the following: 3 g/L ethylenediaminetetraacetic acid (EDTA); 0.09 g/L CaCl2 ∙ 2H2O; 0.90 g/L ZnSO4 ∙ 7H2O; 0.60 g/L FeSO4 ∙ 7H2O; 200 mg/L H3BO3; 156 mg/L MgCl2 ∙ 2H2O; 80 mg/L Na2MoO4 ∙ 2H2O; 60 mg/L CoCl2 ∙ 2H2O; 60 mg/L CuSO4 ∙ 5H2O; and 20 mg/L KI. The pH of the trace element solution was adjusted to 4.00 with NaOH, and then the solution was autoclaved. Seed culture (10%, v/v) was inoculated into the fermentation medium and batch and fed-batch fermentation was carried out in a 5-L stirring bioreactor (Biostat A plus, B Braun, Melsungen, Germany) with a working volume of 3 L. The fermentation was performed at 37°C with the aeration rate of 1.0 volume per volume per minute (vvm) and agitation speed was automatically changed to maintain 15% dissolved oxygen (DO) level, respectively. When the pH decreased to 6.5, it was controlled at 6.5 automatically by adding 3 M NaOH. The protein concentration in the extracts was measured according to the Bradford method using the Bio-Rad protein reagent and ovalbumin as the standard. Biomass was determined using a UV-visible spectroscopy system (8453, Agilent, Palo Alto, CA., USA) at 600 nm with appropriate dilution, and was converted to the dry cell weight (DCW). The intracellular NADH and NAD+ concentrations were measured by procedures presented by Ji et al.. The concentrations of glucose, 2,3-BD, acetic acid, lactic acid, acetoin, alcohol, and acetoin were determined by high-performance liquid chromatography using an Aminex HPX-87H column at 65°C, with 5 mM H2SO4 as the mobile phase at a flow rate of 0.6 mL/minute. ADH activity was determined according to the method described by Cunningham et al.. To determine the enzyme activity, cells were harvested after 18 h of culture under anaerobic conditions, washed with MOPS buffer (50 mM, pH 7.4, containing 4 mM DTT, 10 mM MgSO4, and 10 μM MnSO4), and resuspended with MOPS buffer up to 2.5 mL. The cells were then processed by ultrasonication to collect the crude extracts. The ADH reaction mixtures contained the following in a total volume of 1 mL: 75 nmol NAD+, 100 nmol CoA, 10 μL of 1.0 M acetaldehyde, 20 μL of crude extracts, and CHES buffer (12 mM, pH 8.5). The ADH reaction mixture contained the following in a total volume of 1 mL: 75 nmol NAD+, 20 μL of alcohol, 20 μL of crude extracts, and sodium pyrophosphate solution (12 mM, pH 8.5). One unit of enzyme activity was defined as the generation of 1 μmol NADH per minute. The LDH activity was determined according to the method established by Tarmy et al.. The enzyme reaction mixtures contained the following in a total volume of 1 mL: 0.33 mM NADH, 30 mM sodium pyruvate, 20 μL of crude extracts, and potassium phosphate buffer. The cells were harvested after 12 h of culture under aerobic conditions. The crude extracts were extracted using the same method previously mentioned, except for the addition of potassium phosphate buffer instead of MOPS buffer. The unit of enzyme activity was defined as the oxidation of 1 μmol NADH per minute. The PTA activity was determined according to previous studies, with minor modifications. The enzyme reaction mixture contained the following in a total volume of 3.005 mL: 2.95 mL of 0.1 M potassium phosphate buffer (pH 7.4), 20 μL of 0.2 mM acetyl-CoA, 30 μL of 0.08 mM DTNB, and 5 μL of dialyzed extract. The cells were harvested after 18 h of culture under aerobic conditions. The crude extracts were extracted using the same method previously mentioned, except for the addition of potassium phosphate buffer instead of MOPS buffer. One unit of PTA was defined as the amount of enzyme that generates 1 nmol CoA per minute. The activity of β-galactosidase was determined by our previous reported. The lactose permease activity was determined as the method of maltose permease activities, with minor modifications (lactose was used as the maltose). One unit of lactose permease was defined as the amount of lactose uptake by 1 g DCW biomass per minute. Where qACE = specific formation rate of aceion mmol/g/h; qBD = specific formation rate of 2,3-butanediol mmol/g/h; qEtOH = specific formation rate of ethanol mmol/g/h; qHAc = specific formation rate of acetic acid mmol/g/h; qLac = specific formation rate of lactic acid mmol/g/h; qS = specific consumption rate of glucose mmol/g/h; qSUC = specific formation rate of succinic acid mmol/g/h; RC = carbon recovery; RH = reducing equivalents recovery; μ = specific growth rate/h. This research was financed by the Cheung Kong Scholars and Innovative Research Team Program in University of Ministry of Education, China (Grant Number IRT1166), the National High Technology Research, and the Development Program of China (863 Program) (Grant Number 2012AA022108), the National Agricultural Research Projects Funded (Grant Number 2012AA101805). The authors thank Dr Haixia Xie (Institute of Hydrobiology, Chinese Academy of Sciences, China) for providing the pRE112 plasmids, S17-1 λpir, and MC1061 λpir, as well as Dr Yu Zheng (Tianjin University of Science and Technology, China) for providing the K. pneumoniae KG1 strain. XG designed and performed the experiments, and drafted the manuscript; CC, YW, CL and MW performed some experiments, analyzed data and drafted the manuscript; CZ and YC provided some reagents, helped to design the experiment and drafted the manuscript; HP and DX designed the experiments and supervised the project; XG, HP and DX analyzed the data and critically revised the manuscript. All of the authors read and approved the manuscript.